This vacation home is located about three buildings from two pools and spas and is at the front of Rancho Las Palmas Country Club. 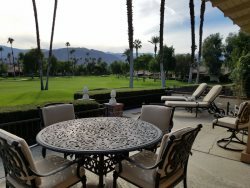 It is within walking distance to EVERYTHING ... the club house, The River, Rancho Las Palmas Shopping Center and Rancho Las Palmas Resort and Spa. Walk to Starbucks in the morning, dinner and a movie in the evening ... or treat yourself to a spa day at Rancho Las Palmas Resort. Beautifully decorated throughout with all the comforts of home, this popular 30 plan, end unit is an ideal vacation home for short family getaways or an extended stays. The spacious great room has contemporary décor and a comfy sofa, loveseat and oversize chair and ottoman (don’t fight over the chair! ), and features a large flat-screen TV with cable channels, DVR and DVD player … but whose watching TV when you have this spectacular fairway view through the wall to wall, ceiling to floor windows! This condo sits at a northeast angle, so you will get plenty of sunshine on the back patio in the mornings, an expansive double fairway view, overlooking a lake and a sand trap in the distance. The patio is exceptionally well furnished with a table and chairs for four, a couple of additional rocking chairs, loveseat and two chaise lounges as well as a gas BBQ. Guests will enjoy the patio’s lighted ceiling fan on toasty days and the additional light it provides will allow for evening dining. Back inside, the kitchen has been updated with stainless appliances, fresh paint and plenty of kitchen supplies for family or entertaining guests. There is also a pub table that seats two for casual in-kitchen dining or visiting with the chef in your family. A formal dining room seats six. Originally an atrium, a small room off the living room has been furnished as an office and guests will love having a space to set up their lap top, and if desired, close the French doors for privacy. The master suite has been furnished with a comfortable king bed made up with lovely bedding and guests will enjoy the big, overstuffed chair and ottoman, perfect for reading or watching the large flat-screen TV. The on-suite bath has two vanities and a walk-in shower. Both guest bedrooms have been furnished with comfortable queen beds and flat-screen TVs and share a hall bath with tub/shower combination. The home has Wi-Fi and local only land lines. The owner will “consider” adding long distance US and Canada for extended stays if requested by guests prior to booking. Please mention that you require this service when inquiring about this property, otherwise please bring your personal cell phone for long distance calling. Only local phone service provided. The double garage has access for only one vehicle and there is ample parking for two vehicles in the driveway. The owner will consider a small dog with a pet fee. Please inquire first for owner pre-approval. This is not your typical vacation home. It has been appointed as you would your own home with quality furnishings and appliances, beautiful décor and is well maintained. This is a property that will be hard to leave!